People usually grill during Memorial Day weekend. We decided to do something a little different and make ice cream by hand. I am not talking about using one of those wimpy, electric powered gizmos that you place in the freezer over night. Nope. 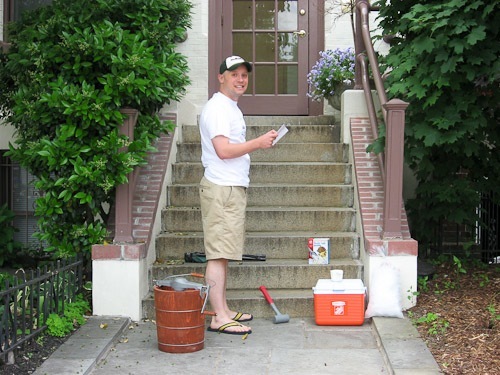 I am talking about good, old-fashion ice cream makin’ using a 4 quart, hand churned White Mountain Ice Cream Maker. This American-made beauty has a wooden bucket where you place the ice and rock salt. The rock salt helps the ice get below freezing and get extra cold. This chills a stainless steel canister in the middle. There is a beater inside the canister that churns the ice cream, helping it freeze evenly and preventing crystals from forming. 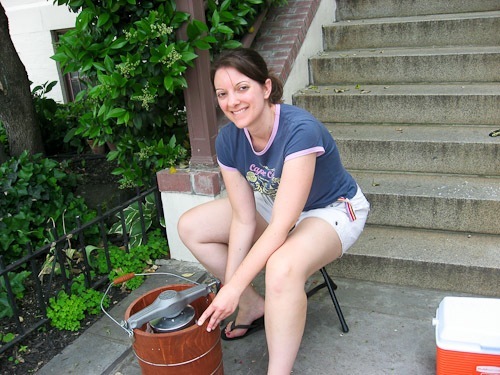 You turn the beater using a crank on the side of the bucket. This things is heavy duty! Instead of making boring plain old vanilla ice cream, I thought I would make one with a custard base. The only real difference is that you add eggs and cook it a little bit, turning it into a custard. 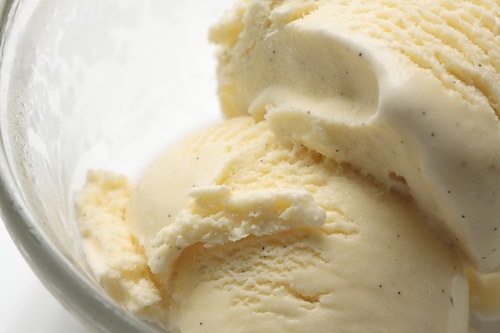 French vanilla is a custard ice cream and plain old vanilla is not. Little did I know that Carolyn doesn’t like custard! More for me I guess! The only problem is that this ice cream isn’t exactly “Lite”. Luckily, it seems to be keeping very well and is perfect for having a scoop every now and then. While it is more fun to make this ice cream in a hand turned maker, it should work in other types of machines. Let us know how it “churns” out! If necessary, two teaspoons of vanilla extract may be substituted for the vanilla bean. To maximize the extract’s potency, stir it into the chilled custard just before churning. Position a strainer over a medium bowl set in a larger bowl containing ice water. Heat the milk, cream, 1/2 cup of the sugar, and the vanilla seeds and pod in a medium saucepan over medium heat, stirring occasionally to break up the vanilla seeds, until steam appears and the milk is warm (about 175 degrees), about 5 minutes. Meanwhile, whisk the yolks and remaining 1/4 cup sugar in a medium bowl until combined and pale yellow. Whisk half the warm milk mixture into the beaten yolks, 1/2 cup at a time, until combined. Whisk the milk-yolk mixture into the warm milk in the saucepan; set the saucepan over medium heat and cook, stirring constantly with a wooden spoon, until steam appears, foam subsides, and the mixture is slightly thickened or an instant-read thermometer registers 180 to 185 degrees. (Do not boil the mixture, or the eggs will curdle.) Immediately strain the custard into the bowl set in the ice bath; cool the custard to room temperature, stirring it occasionally to help it cool. Cover and refrigerate until an instant-read thermometer registers 40 degrees or lower, at least 3 hours or up to 24 hours. Remove and discard the vanilla pod from the custard (or add the vanilla extract, if using) and stir well. 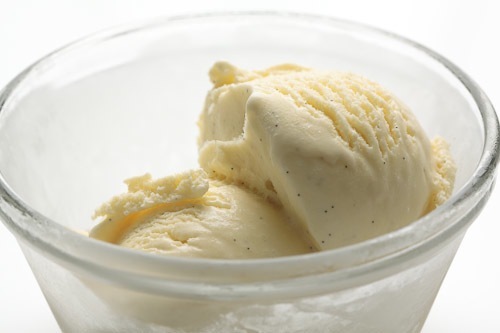 Pour the custard into the ice cream machine canister and churn, following the manufacturer’s instructions, until the mixture resembles soft-serve ice cream. Transfer the ice cream to an airtight container, press plastic wrap flush against the surface, cover the container, and freeze the ice cream until firm, at least 2 hours. 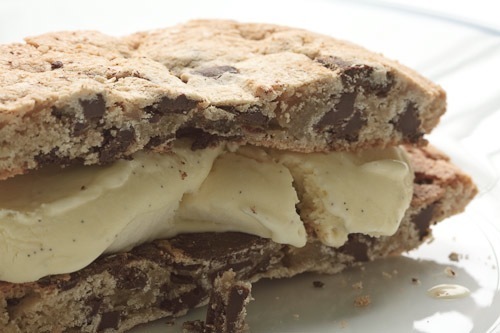 Sandwich a scoop between two cookies for an extra treat! I tried Vanilla ice cream… it had egg smell, although i used vanilla essence. i have same hand machine. later when i kept the ice cream in freezer the result was not as creamy as store bought ice creams. Why? what is the secret behind those ice creams???? Me Too – this makes me happy as well. I’ve come back to this twice. It makes me happy.